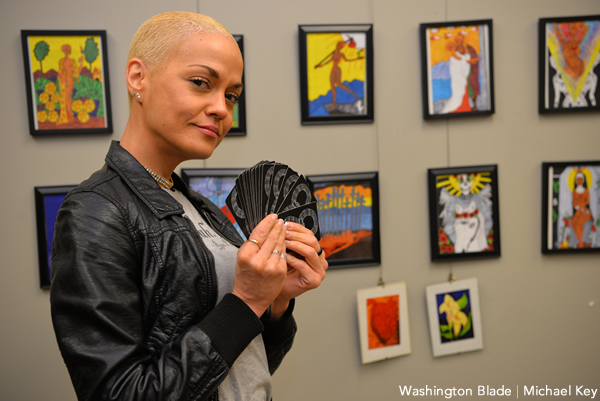 Three key loves came swirling together for local artist Jo Martinez in her current exhibition at the DC Center — art, the Tarot and safe, affirming LGBT spaces. Being “a real big fan of volunteering and putting out positive messages in the LGBTQ community,” inspired Martinez to seek out the center upon relocating to the Washington area two-and-a-half years ago. Martinez discovered the tarot growing up in an environment that used various tools of divination. Tarot cards, she says, just resonated with her. Now she not only gives readings, she has designed her own tarot card deck called “The Fools Journey,” on display now at the Center Arts Gallery (2000 14th St., N.W., no. 105). Individual cards may be purchased or full decks are available for $65. Details at thedccenter.org. Martinez worked on the deck of 84 cards (most tarot decks feature 78 cards; her additional cards are special “oracle” cards) for about two years applying what she calls her “vibrant and raw art style with a kick” to the usual images used in traditional tarot cards. Two other decks — “Behind Closed Doors Oracle” and “Luscious Lenormand” — are also on display along with other Martinez works. They can be viewed at the Center through the end of March and online at foxx7122.wixsite.com/jo-offduty. She’s single and enjoys art, of course, reading, yoga and jogging in her free time. Six years; the hardest person till this day is my mother. That’s easy — RuPaul. Now sashay away! I’ve been here only two years and have yet to explore more, but I enjoyed Nellie’s Sports Bar, the Dirty Goose and Town Danceboutique. I’m not “pro” weddings. A partner who loves and respects you will be at your side no matter what and legal documents don’t necessarily reflect that love. Segregation in the 1960s within the school system. A governor’s motto in that time was “No, not one,” referring to the number of black children that should be allowed to attend schools alongside white children. I can’t wrap my head around that! Not only because children are our future, but because education are the doors to your future. The 1980s with Prince in “Purple Rain” and Boy George. “Give me options, damn it!” Also equality. I try to post daily my different art work and my posts are called “My He/Art” or art of the day. I don’t have either Facebook or Twitter but I have Instagram (Jooffduty7). I’m all for what makes an individual happy. I’d be fine with it as long as the individual is not doing it to please someone, but doing it for their own well being. To not give up the fight. If we made it as far as gay marriage equality, then obviously our voices are being heard. It really takes one person to make a change or impact in this world. That if you’re gay (LGBTQ) that you automatically want to hit on a non-queer friend. A hug and kiss on the cheek when you meet a person. I was taught in my culture, certain individuals think you’re trying to sleep with them and that is so not the case! That I can be in the same career field a man is in.